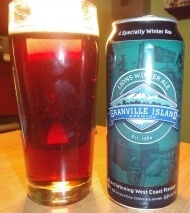 Our LIONS WINTER ALE combines premium malt with aromatic specialty hops. The vanilla-like finish of this robust ale is a great excuse to get out of the cold and enjoy BC’s favourite winter beer made from the finest natural ingredients. Pours golden with lots of carb and a surprisingly Guinness-like creamy head; though the head fizzed away quickly like after pouring a Coke too fast and left no lacing. The colour is quite wonderful, gold on the pour turning to a rich clear brick red in the glass. The nose hits you right from the pour and is quite amazing. It is insanely sweet with caramel malt aromas mixed with a heavy hit of vanilla. I wouldn't be surprised if they used actual vanilla beans in the recipe or more likely an artifical additive. I'm hoping it will open up more layers on the taste, but it's already a unique take on a winter ale. Surprisingly flat for all the carb upfront. While lack of carbonation isn't uncommon in an ale, here it is a detriment as it leaves one with the mouth-feel of flat vanilla pop. 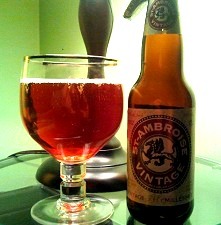 There is a funky hop bite on the finish that seems out of place and reminds me of cherry cough syrup, along with some lingering hints of Rice Krispies. I snagged this one while out of town, as I hadn't seen it locally, and was pretty excited to try it. Since getting into craft beer I've heard a lot about Granville, some good and some bad, but I'm leaving that at the door for this review as I do quite enjoy their English Bay Pale Ale. However, Lions Winter Ale by any measure falls far short. The vanilla nose becomes cloying and medicinal, the mouth feel is watery and the taste is a mix of bland and unpleasant. I would not try it again. I give it a D.